When I import into LBPm I import by the day... not leg. However, in the local time it only shows the times for the last flight. So, if I fly from 0800-1800 that day, but my last leg is from 1700-1800. The time listed is 17-1800. I don't currently use the calendar function due to APDL, but if I did it would not show a correct block of 12 hours like it used to. Thanks, I'll review it, the Schedule Importer in Logbook Pro Mobile is about to be completely redone to the newer architecture (not the new thing in APDL). Please don't make it completely automatic... APDL being automatic with no way to make a custom pairing is undesirable. Crew names don't download out of FLICA the way my logbook has them. I have to go in every trip and change the layout. I don't want to have to do that every day or leg. I knew that would open a can of worms, it's not what you think. Logbook Pro uses an older system that is more text based in processing, the new system is more structured, accurate, ... I'm trying to make this easier to understand. The system itself will look the same to you, it's how we get and work with the data will be much better and not have weird time issues like midnight, etc. Uggh, let's just leave it as "I'll check into it"
OK, the times are now correct as in they cover more than just the last flight of the day. The first flight I have today is a DH. 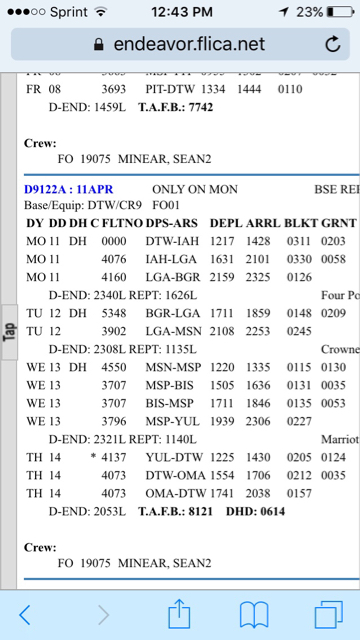 The DH is not on the flight list, but the times that are listed include the DH. I'm unsure if I like or dis-like it that way. On the one hand the times covered don't match the days flying, but it does give you a heads up that the day starts earlier than the first "live" flight. I'm unsure so far how it is affected if a DH happens on the last flight of the day. Do you have the option of importing DH enabled in Settings > Schedule Importer? Sure, and it's not selected. I don't want to see the DH. But, the times imported don't match the flights. I think (possibly) if it imports the DH it should apply the time. If it doesn't import the DH then it (might) should start the time with the time of the first live flight. It's just inconsistent, IMO. I still am not sure if I like or dislike how it is though. I'm certainly not passionate about it. 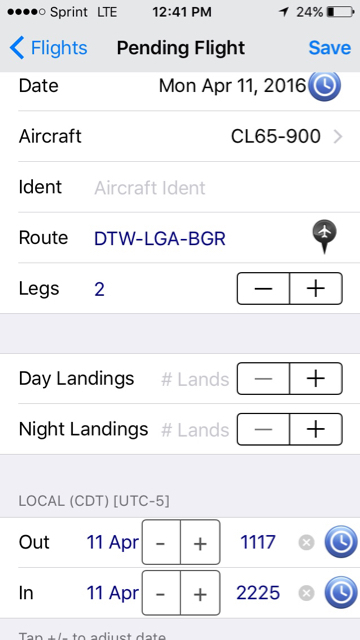 Each flight has its Flight Date set to the leg's OUT TIME in your app's time zone per Settings / Timezone. The OOOI values should match the incoming leg exactly as we get it from the server in UTC and it's converted again to your app's time zone. So I am not sure where there is a mismatch in a date or time. If you want to post screenshots of comparing X to Y that may help or email me the info privately as desired. Wait - are you By Day or By Leg? Okay, so you are By Day. I'll have to check into this. I really really really discourage By Day, I really wanted to stop supporting it but internally we decided to keep it for consistency of prior data. So the interim fix is try By Leg, I'll again look into how we're handling the data shaping for By Day with DH off. Okay, so to clarify your OUT time is wrong because that's the DH? I can fix this server side....looking into this now. Excellent beta tester feedback Sean. I fixed this and deployed it to the server, can you delete and reimport this one and let me know how it is now? Perfect. Times now reflect the start of the first leg through the end of the last leg. I also modified a pairing to create a DH as the last leg of the day and it imported the times correctly as well. Excellent! Thank you for the catch!